to be looking upward at something of interest. I consider what writers say about the kingfishers, little birds who build their nests on the beach near the sea. They build it in a circular form and so tightly compressed that the sea water cannot penetrate it . . . Here these graceful little birds place their young ones, so that when the sea comes upon them by surprise, they can swim with confidence and float on the waves . . . I want your heart to be like this: well compact and closed on all sides, so that if the worries and storms of the world, the evil spirit, and the flesh come upon it, it will not be penetrated. Leave but one opening to your heart that is toward heaven . . . How I love and am enraptured by those little birds. The monastery garden at Our Lady of Grace was a quiet and secluded place that was surrounded with fruit trees, a long row of cypress trees and one pine tree. Padre Pio and the other members of his religious community would usu­ally gather there each day. 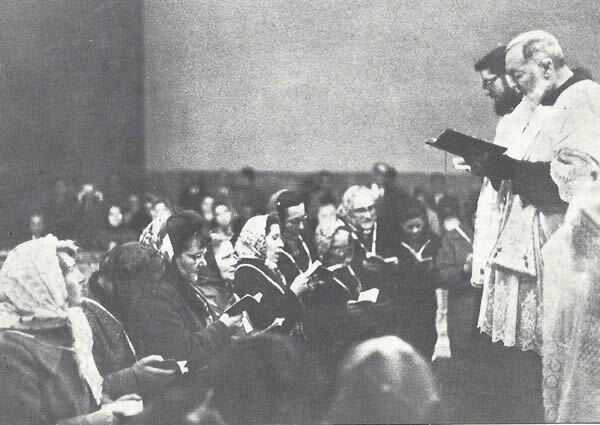 Sometimes, members of the laity were invited to join them. In the summer time, when the weather was hot, Padre Pio would often go to the garden in the early evening. It was a time of fellowship and conversa­tion, a welcome respite from the intensely busy days at the monastery. Dr. Nicola Centra recalled an extraordinary event that happened on one occasion in the monastery garden. One day when Padre Pio was there with several companions, without warning, a flock of birds flew down and settled on the nearby trees. Sparrows, larks, warblers and more were there in great numbers. Suddenly, one of the birds began to sing loudly, followed by a great flapping of wings from the other birds. Then all of the feathered friends began to sing in unison. It was like a marvelous symphony of chirping, whistling, high-pitched rills and trills. It was indeed beautiful to listen to. However, on that particular day, the birds were so loud that Padre Pio was unable to carry on a conversation with his friends. He could not be heard above the chatter. Suddenly, Padre Pio looked upward at all the birds in the trees and said with authority, “Quiet, that’s enough!” Immediately, the sound of the birds ceased altogether. A great silence descended on the monastery garden. Padre Pio then resumed his conversation as though nothing had happened. But something amazing indeed had happened. Those who were in the garden at the time and witnessed it, considered it to be miraculous. 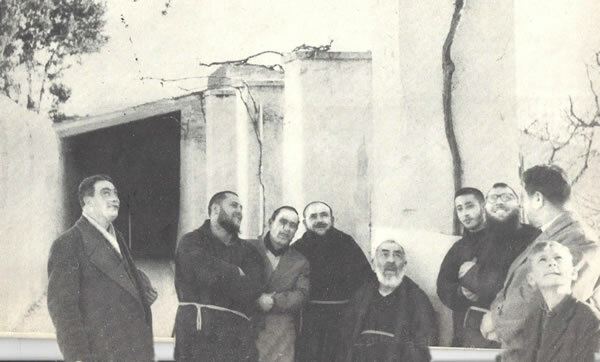 For many years Padre Pio was assigned as spiritual director to the members of the Third Order of St. Francis in San Giovanni Rotondo. The meetings were usually held in the monastery but in the early days the meetings occasionally took place in the homes of the members. Much to the amazement of all who were present, at Padre Pio’s words, the bird immediately stopped singing. He still moved his head from side to side but he made not a sound. The members of the Third Order who were present could only conclude that in some mysterious way, and on some level, the little creature had understood Padre Pio’s wishes. At the conclusion of the meeting, when Padre Pio left Vittoria Ventrella’s home, the bird began its high volume singing once again, just as it had before being silenced. The news spread quickly and it wasn’t long before everyone in San Giovanni Rotondo learned of the miraculous incident. Stories abounded, more than could be counted, which attested to Padre Pio’s unique charisms. Many had a desire to ask Padre Pio about his remarkable spiritual gifts, but few had the courage to bring up the subject. Even the Capuchins who were with him on a daily basis rarely spoke to him about such matters. Padre Pio was reserved and private by nature and did not welcome such inquiries. Anna Romanazzi’s husband passed away on November 18, 1954 at the relatively young age of fifty-four years. Anna’s grief was so great that it immobilized her. She did not know how she would be able to carry on. In addition to the emotional pain of losing her husband, Anna also had many physical problems to contend with. She suffered from sacro-lumbar arthrosis as well as a herniated disk in her spine. She lived with chronic and severe pain. The doctor prescribed a plaster cast for her to wear and told her that an operation would probably be necessary sometime in the future. After her husband passed away, Anna no longer wore the plaster cast, the “instrument of torture,” as she called it. She lost all interest in life. Her four adult children became very concerned about her. Anna knew that she had some very important decisions to make. Before her husband’s death, he had expanded his business interests from Bari to Rome. Anna did not feel that she had either the ability or the strength to take on the responsibility of managing the business. Seeing how depressed Anna was, her sister decided to take her to see Padre Pio in San Giovanni Rotondo. She also made arrangements for Anna to make her confession to Padre Pio. Anna was told that Padre Pio would hear her confession at a designated corridor in the church. When Anna saw Padre Pio sitting in a chair at the appointed place and realized that he was waiting for her, she was overcome with emotion. She walked to where he was sitting, fell to her knees and said to him, “Padre Pio, help me find resignation!” At that moment, the Rosary she held in her hand fell to the floor. Padre Pio bent down to pick up her Rosary and when he handed it back to her, he placed his wounded hand on her shoulder. “His eyes were beautiful and full of compassion,” Anna said. With great gentleness he said to her, “You are so devoted to the Sacred Heart of Jesus. Recommend yourself to Him. I absolve you. Go in peace, my daughter.” He then made an extensive sign of blessing over her. There was no need for words. Anna knew that Padre Pio understood her soul. After Anna heard Padre Pio’s message, she left her home in Bari and traveled to Rome for an appointment with the specialist. The x-rays showed that there was no longer anything wrong with her spine. Anna never had any trouble with her back again. She remembered that Padre Pio had placed his hand on her shoulder and prayed for her for an extended period of time. “Padre Pio obtained for me from the Lord, peace of mind, resignation, and bodily health to sustain me and to sustain my children,” Anna said. It was the beginning of a whole new life for her. In 1955, Bishop Orestes Marengo, S.D.B. served as head of the Catholic diocese of Dibrugarh in northeastern India. When he first arrived in Dibrugarh, the residents of the town were still coping with the devastating effects of a terrible earthquake that had occurred some time before. The earthquake had caused dangerous landslides as well as flooding. A dyke was built to protect the area but it was eventually demolished by flood waters. As a result, some of the finest houses in Dibrugarh had been destroyed. At the time, the Sisters who belonged to the religious congregation, Daughters of Mary Auxiliatrix, were building their first school in Dibrugarh. Bishop Marengo agreed to fund the project even though his financial resources were very limited. One day, the Sisters spoke to Bishop Marengo about their concerns regarding the precarious future of Dibrugarh. Due to the problems that resulted from the earthquake, the authorities were speaking of the possibility of an evacuation of all the residents of the city in favor of a permanent relocation to a safer region. If the city was going to be relocated, the Sisters felt that the construction on the school should stop at once. An enormous sum of money had already been spent in the building of the school. To continue to build would simply be throwing good money away. Because everything was so uncertain, the Sisters urged Bishop Marengo to write a letter to Padre Pio and seek his advice in the matter. They explained that some of their Sisters in Thailand once sought out Padre Pio in a difficult situation. Through him, they received the help and guidance they needed and in turn, they were led to a successful resolution of their problem. Bishop Marengo decided to act upon the Sisters’ advice. He wrote a letter to Padre Pio, giving him a detailed account of the entire situation in Dibrugarh. He explained that the authorities thought it might be best to build a new city forty-five kilometers to the north. Padre Pio’s reply came a little more than two months later. It was a short note written in English by his secretary, Father Dominic Meyer. Padre Pio’s message was this: “Your Excellency, tell the good Sisters to go on working zealously for the Lord and not to be afraid. The government will build a second defense against the river, and the city will be saved.” Soon after the bishop received Padre Pio’s letter, engineers from Bombay arrived and were able to make steady progress in securing the city. It was a joyous day when the Little Flower Catholic School in Dibrugarh was finally completed. It functioned in an excellent way from the first day that it opened its doors to the public. It was truly a blessing to the people of the community. The bishop treasured the letter that Padre Pio sent to him and decided to keep it on permanent display in the school for the benefit of all. Bishop Marengo made a trip to San Giovanni Rotondo in 1960. He was able to greet Padre Pio in the sacristy both before and after Mass. Not only did he have the privilege of attending Padre Pio’s Mass, he was also invited to visit Padre Pio in his cell so that they could speak together privately. He was able to thank Padre Pio personally for his prophetic words, words which gave him courage during that fearful time when the future of the young Catholic diocese of Dibrugarh was so uncertain. After Mass, Teresita’s son put his name down to go to confession to Padre Pio and was told that he could make his confession at four o’clock that afternoon. Shortly before the designated time, he went to the sacristy where he was greeted by three other men who were also waiting to make their confession. “Where are you from?” one of the men asked him. “From Switzerland,” he replied. “I believe that Padre Pio was looking for you,” the man said. “Earlier today I heard him asking, “Where is the young man from Switzerland who is going to make his confession?” “But that is impossible,” Teresita’s son said to the man. “Padre Pio does not know me. He has never met me. I arrived here just last night.” “But Padre Pio knows everything,” the man replied. Padre Pio officiates at a ceremony for members of the Third Order of St. Francis in San Giovanni Rotondo. The following testimonies were submitted on our Padre Pio Devotions website: www.padrepiodevotions.org. Simply click on the “Testimonials” link on the website if you have a testimony to share. I have a friend named Glenda who is a Protestant and belongs to the Presbyterian denomination. I shared the prayers of Padre Pio with her and told her about his life and his familiar saying, “Pray, Hope, and Don’t Worry.” I gave her a Padre Pio Rosary. I also gave her a pamphlet on how to pray the Rosary and suggested that she pray it each day. Glenda thought it was a good idea and began to pray the Rosary every morn­ing. She told me that whenever she had entered a Catholic Church in the past, she always had a special feeling. I told her that she was feeling the real pres­ence of Jesus in the Blessed Sacrament. Glenda had to go to the hospital for quadruple bypass heart surgery. Her sister called me to let me know that she came through the surgery just fine. However, her sister said that the doctor had come to her room the next day and he was perplexed. He told Glenda that she was repeating some initials during the operation, and he, as well as all of the doctors and nurses who were attending her, were curious as to what she was saying. He said that none of his patients had ever murmured even one word during open heart surgery. The anesthetic they are given is so strong, that they are not able to utter a sound in their unconscious state. But Glenda, for some reason, was different. “What was I saying?” Glenda asked him. “You were constantly repeating the initials, P. H. D. W.” the doctor answered. “We would like to know what it stands for.” Then Glenda understood and told him, “It stands for “Pray, Hope, and Don’t Worry.” The doctor has since shared the phrase with his patients who are preparing for surgery. About three years ago my niece, Patricia Gail, was diagnosed with thymus cancer. She was told to get her affairs in order and to make provisions to have someone take care of her two children, for she did not have much time left. Gail is not a practicing Christian, but she does believe in Jesus as her Savior. I worked at a Catholic Book and Gift Shop and bought her a St. Padre Pio Rosary, had it blessed, and took it to her in the hospital. I told her about St. Pio and the many healings that occurred through him. She informed me that she was not Catholic and did not know how to pray the Rosary. Her surgery was the next day and time was a factor so I told her just to touch each bead of the Rosary and say, “Jesus, I love You.” After the surgery, the doctor came to the waiting room and said that he removed all of the tumor. He said that it looked to be cancer and the blood work showed it to be cancer and that she would most likely need to have chemotherapy. At least ten days went by and Gail was so surprised when she learned the results of the lab work. The tumor was not cancerous and she was healed. Gail was told that she was a miracle. I even heard her state that she was a miracle. I thank God for the gift of believing and seeing with my soul His marvelous miracles and feeling His comforting love. Two years ago, I was offered a job which required a complete physical examination, including a hearing test. I passed the physical but I failed the hearing test twice. I was told to get another hearing test at my own expense. If I failed that test, I would lose my chance for the new job. I felt very anxious about the situation. Three years before I had been diag­nosed with a form of degenerative hearing loss. It also produced symptoms such as vertigo and nausea. I was certain that I would fail the next hearing test. On the day of my appointment with the specialist for my last attempt to pass the hearing test, I had taken my daughter to a Catholic bookstore in Hampton, New Hampshire. While there, I noticed a dvd about Padre Pio. I did not know very much about him. As I read the words on the cover of the dvd, I felt an itching sensation deep inside both of my ears. I also felt as though my ears were being tickled. I did not pay too much attention to it because I had become absorbed in reading the information about Padre Pio on the dvd cover. Later that afternoon, I had my hearing test. I was tested twice. They also looked at the paperwork I gave them with the results of my two previous tests. “Mr. Warner,” the doctor said. “Your hearing is perfect. There is noth­ing wrong.” I was so happy that I shouted for joy and I was very surprised as I noticed that for the first time in years I could hear everything. Also, the pain in my ears was gone. I told my parish priest the whole story and he told me that I had received a healing through Padre Pio’s intercession. I was hired for the job and my hear­ing has continued to be perfect. My Son’s Life was Out of Control My son Ken is an alcoholic. When I shared my worries about Ken with a friend, he said that he would write to Padre Pio’s monastery in San Giovanni Rotondo and ask for prayers on my son’s behalf. Ken would drink every single day and he drank throughout the day, consuming large quantities of beer and tequila. He had no appetite for food. His memory was short and he could not hold down a job. He was a chain smoker and was also addicted to TV. He had stopped going to church. His life was out of control. About two weeks before Easter, Ken and I started praying together and we have continued to do so ever since. Each day we have been praying three Hail Mary’s. After each Hail Mary we pray, “By thy holy and Immaculate Conception, O Mary, make my body pure and my soul holy,” and “O my Mother, preserve me this day from mortal sin.” We then pray the prayer to St. Michael the Archangel, the Act of Contrition and finally the prayer for Padre Pio’s intercession. Ken went to Mass with me on Holy Thursday. During the service, Ken was kneeling next to me. At that time, I prayed and asked Padre Pio to heal my son of his addictions. As I prayed, I felt a great sense of peace come over me. That night when Ken returned home, he happened to find ten patches to help him stop smoking. Since Easter Sunday, all of Ken’s addictions have been lifted. He has not had a drink and has not smoked a cigarette. He has had only minor withdrawal symptoms. He has a good appetite now and is working most every day. He is making an effort to pay off his debts. He has decided that he does not want to indulge in frivolous things or buy anything until he can afford to do so. He has also canceled certain TV programs. He tries to keep busy so that he will not waste his time watching TV. He has decided to go back to church and is pre­paring to make a good confession. He calls me every day so that we can pray together over the telephone. He is trying to regain his health with exercise and healthy eating. I feel confident that Padre Pio was instrumental in lifting the chains of vice that Ken was bound to. This entry was posted in Newsletter Archives by Diane Allen. Bookmark the permalink.